I woke up the other day to see that one of my favorite bloggers, Peter Greene at Curmdugucation, had written a blog post about Stand for Children. As an Oregon teacher who has worked to improve schools and change out of school factors to help all children succeed since I started teaching here in 1994, Stand for Children is a group I’m very familiar with. I first heard about them when my youngest daughter, who is now 21 years old, was in fourth grade. The class sizes at her school had ballooned to 30 and up (a sad state many, if not most, Oregon classrooms remain in today). Back then, Stand was out there advocating for things like smaller class size and adequate funding and better access to health services. My dad (from here on referred to by name: Rex Hagans) heard about the group and he got involved; so involved that eventually he came to work with their state leadership along with his friend, Tom Olsen. Rex and Tom were both recently retired educators of the PhD variety who had worked at Northwest Regional Educational Laboratories in Portland. Back then we all lived in Canby, a smallish town near Portland. Soon after Rex and Tom started working with Stand, they created a local chapter in Canby and I got more involved. With Rex and Tom as Stand liaisons, I worked with Stand and my school district to help get a dental screening program going there. Eventually, I became a Stand member and then chapter leader in Canby. It was right about then that things went wrong. I heard that there was a new head of Oregon Stand (I now know her name was Sue Levin). Soon after that, there started to be an uncomfortable push coming from the top of the organization down, asking us to have conversations with people about “teacher quality”. It was a big change in focus from fighting for funding and against poverty. I, as a teacher and proud member of my union, became bothered by some of what I was hearing because it sounded as if someone suddenly thought school funding and poverty were not the problems with schools, but that my colleagues and I were. There was a day when the Stand rep who came from Salem met with us and I told her that I could no longer continue working with them for that reason. I resigned from the group. Many other people at the meeting also quit the local chapter when I spoke up that day. Later, Tom Olsen quit the state leadership group. And a soon after that Rex Hagans was asked not to return to his volunteer position at the state level due to his refusal to go along quietly with the new direction of the organization. We were all very disillusioned. Then one day I read this post from Susan Barrett on Parents Across America blog. It sounded exactly like what had happened to us! I told Rex and Tom about it and the next thing I knew, Tom Olsen had written a blog post as well. Those blog posts brought Tom, Rex, and Susan together to organize the first meeting of what came to be Oregon Save Our Schools. People showed up from all over the Portland area, mostly former Stand members who had had similar experiences and had connected through those blog posts. When I go back and look at those posts now, I see names of people I didn’t know before making comments and connecting to organize: people that I have now worked with for years. We were a group of disillusioned Stand for Children members who recognized that we still needed to fight for school funding and had come to realize that we needed to fight corporate take over of our schools as well. What was happening in Oregon and around the country at that time was a result of Stand for Children’s evolving funding sources, what Adam Sanchez and Ken Libby called in a 2011 article in Rethinking Schools “an enormous influx of corporate cash” that drove a change in their agenda. Frequently over the years since then, as we at OSOS have fought corporate driven policies in Salem we have found ourselves standing on the opposite side of issues against Stand for Children. At one time, Stand for Children held vast sway in the office of Governor John Kitzhaber, who resigned amid accusations of influence peddling. And they are still a fairly mighty presence in Salem today in spite of the fact that Kitzhaber, for whom Stand became his go to education advisors, has been gone for over a year. Though their influence has dwindled somewhat, a representative of Stand for Children sits on the Accountability Workgroup, one of the Oregon Department of Education’s four ESSA (Every Student Succeeds Act) workgroups which are developing recommendations around the new education law. More concerning is that Toya Fick, Executive Director of Oregon Stand for Children, also sits on the Oregon Department of Education Advisory Committee, the committee which will finalize Oregon’s regulations on how to proceed following the recent passage of ESSA after hearing from all four work groups. We at Oregon Save Our Schools have always felt that many aspects of the corporate reform agenda are harmful and a violation of students’ civil rights. Stand for Children has maintained that they are defenders of those same rights. But it appears Stand for Children has run into a bit of a snag in its efforts to represent itself as a civil rights champion. On July 29th, news broke that the national NAACP convention had voted in a resolution on charter schools that, among other things, condemns privatization of public schools as well as opposes publicly subsidized funding of charters. This came just one day after a story out of Washington state where Stand for Children has spent over $100,000 just this month to defeat Washington Supreme Court Justice Barbara Madsen who wrote the court’s opinion declaring publicly funded private charters unconstitutional in Washington. And according to Mercedes Schneider, they stand ready to spend a lot more. 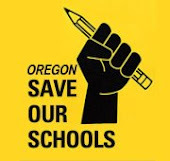 Oregon Save Our Schools is a true grassroots movement. We have no budget and no funding source. We rely on volunteers and an occasional passing of the hat to fund events or purchase materials. I think it’s time to stop pretending Stand for Children is a local or “grassroots” group. I’m tired of hearing them called “community partners” by state officials. They are a lobbying group for national and multinational corporate interests, working in states across the country and funded principally by out of state billionaires’ groups like the Gates and Walton foundations. We at Oregon Save Our Schools have known for a long time that they do not “stand for children”. When it comes to running Oregon’s schools, Stand should take a seat, and not a seat at the head of the table. ESSA is supposed to return control of our schools to the people of the state. Maybe what Stand really needs to do is take a hike.